You are here: Home » Games » FIFA 13 » FIFA 13 with Wepeeler | Let’s Talk – Favourite FIFA? 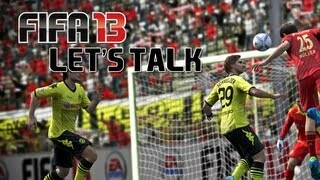 FIFA 13 with Wepeeler | Let’s Talk – Favourite FIFA? Welcome to the next episode in my new series where I ask a question on Twitter, get some feedback and then give my honest opinion on the subject. So what is YOUR favourite FIFA??? Please leave me your feedback and thanks for watching! FIFA 13 with Wepeeler | Let’s Talk – Favourite Gaming Console/Game?